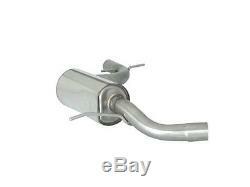 Intermediate muffler seat leon ii 57.0043.00 ragazzon 2.0tfsi en / cupra (147 / 177kw) 09/2005. Intermediate silencer stainless steel cutting of the original intermediate. For installation on the original rear silencer, the sleeve indicated in the catalog must be ordered separately. Inlet outside diameter 60 outside diameter tube 60 outgoing outside diameter 65 The lines evo line and evo one line give a real sporty look to your car, assuring an easy assembly as well as the simple "sound" ragazzon. The whole range, entirely in stainless steel aisi 304, includes many CEE approved products: complete lines, various articles, from catalytic converter to rear silencer with side exit, lines for competition group n and catalytic converters with homologation fia csai . These lines offer high performance products that help reduce back pressure and increase engine power while reducing fuel consumption. There are 50 models of bits available to create an innovative and captivating design suitable for all car models. The lines evo line + evo one line offer a range of luxury silencers, which ensure a long life of the sports exhaust pipe. The evo line line includes all car models before 2002. On order 7-14 days (except models only on manufacture) - shipping by ragazzon italy - standards fia-csai, cee, tüv. Warning: some rare models may be temporarily out of stock or in production, therefore the deadlines may be exceeded. We invite you to consult us for this type of product. From the registrar office to obtain the cee homologation. These controls provide for different phases, such as longevity of the line, backpressure tests, and phonometric tests on and off. The analysis of the resistance of the materials used to make the muffler. If the exhausts pass the tests, the approved organization issues the. We have been trading on the internet since 2001. Importer of the brand tyc lighting and mirrors. Importer for France of the brand car sound catalysts replacement. Importer for France brand magnaflow performance lines / stainless steel exhausts. Importer for France of the asso brand racing sports exhausts. Official distributor ragazzon lines sports exhausts and performance. + 38 000 references in tolerie / bodywork for Korean Asian Europeans. To contact the good service. Tel salesperson / advice: gilbert 04 42 49 69 24 06 60 17 33 17 from 14:00 to 17:30. Tele-salesman / advice: solène 04 42 49 69 24 from 14h to 17h. We are closed on Saturdays and Sundays. Single-member company with a capital of 1000 euros r. S aix en provence n °: 535 376 008. The tool for free sale. Put your items on sale quickly and easily, and manage your ads in progress. The item "intermediate muffler seat leon ii 57.0043.00 ragazzon 2.0tfsi en / cupra 147 /" is on sale since Tuesday, December 13, 2016. It is in the category "auto, motorcycle parts, accessories \ tuning, styling \ exhausts \ complete exhausts ". The seller is "auto parts-accessories" and is located in priula. This item can be shipped to the following country: France.